Dr. Anthony J. Hornof is an Associate Professor in the Department of Computer and Information Science at the University of Oregon. He joined the faculty in 1999 and was promoted with tenure in 2005. Dr. Hornof earned his Ph.D. in 1999 and his Master's degree in 1996, both from the University of Michigan, and both in Computer Science and Engineering. He received a B.A. in Computer Science from Columbia University in 1988. After college, he remained in New York City for five years (1988-1993) where he worked as an information technology specialist for Deloitte and Touche, and also part-time as a deejay at nightclubs such as Save the Robots and M.K. He also pursued mixed-media painting during these years, and his work was featured in group shows in New York City. In 1993, he redirected his creative and intellectual energies towards a career in academia, where he now integrates his interests in computing, human factors, and creative expression. Dr. Hornof is published in the leading human-computer interaction conference and journals, and has been awarded over $1.75 million in single-investigator research grants, including multiple awards from the National Science Foundation and the Office of Naval Research. Dr. Hornof's research is in human-computer interaction. He is interested in making computers easier for people to use and learn, in finding new ways for people to use computers, and in supporting patterns of human creativity and expression. 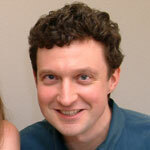 He has active research projects in cognitive modeling, eye tracking, and assistive technology. In Dr. Hornof's cognitive modeling research, he builds computer programs that simulate the human perceptual, cognitive, and motor processes that people use when interacting with a computer. The models incorporate, for example, the cognitive strategies that people use to find something on a computer screen, or to coordinate between two different tasks on a computer, or to use 3D audio cues assist a person in coordinating multiple tasks. The modeling work is useful to user interface designers because it can help them to understand how a person is likely to use a computer interface to accomplish a task. Cognitive modeling provides a scientific and engineering base to assist a designer in improving computer interfaces. Dr. Hornof uses eye tracking to evaluate and improve the accuracy of the cognitive models he develops. Most human-computer tasks involve some sort of eye movements, and the eye movements observed in an eye tracking experiment can show whether a model accurately simulates how people would do these tasks. For example, eye tracking can show whether a model accurately predicts how people skip over web page links of a certain color, such as links that are colored red to indicate that they have already been visited. Dr. Hornof also uses eye tracking for real-time input to a computer, to permit creative expression through eye movements, for two different target audiences. The first audience is children with severe motor impairments, for whom Dr. Hornof has developed EyeDraw, software that is now distributed with a commercial eye tracker and enables children with disabilities to draw pictures by just moving their eyes. The second audience is new media artists and musicians, with whom Dr. Hornof collaborates to develop eye-controlled compositions that have been performed at leading international computer music conferences. Dr. Hornof's research on assistive technology explores the difficult challenge of collaborating with children with severe disabilities, working directly with these children as partners in participatory design activities to develop systems that meet these children's developmental, communication, and creative needs.